You’ve landed in Puerto Vallarta! The airport is full of tourists, time shares and taxis. Let’s go. How long until we’re at the hotel? 45mins. There’s more jungle than you expected, lush and green. The roads in Sayulita are a mix of perfect pavement and cobblestone chaos. Welcome to Mexico. The hotel feels like a large hacienda, everything is gorgeous and sweetly appointed. You drop off your bags, wander by the pool and meet your group for dinner. The food is delicious; you’re hungrier than you thought. More guacamole please. The air is warm on your skin. You open your eyes and remember where you are. The breeze is part ocean, part jungle. Wonderful. The yoga challenges and supports you in all the right ways. You’re excited to learn new things and wondering if you can have a margarita with lunch. Did I say lunch? I meant dinner. While you intended to explore town, instead you nap and pool and nap and pool. After the evening yoga, you join the group for dinner and there’s lots of laughing and a few sunburns. These people are nice. It's a new moon. Your teacher talks about new beginnings and starting over fresh. What a lovely concept. Today the group is hiking Monkey Mountain, and while you'd previously decided to skip it - the "new moon, new you" decides to go. Wow wow wow, so beautiful. Your guide has a small ranch at the base of the mountain. He knows every plant. Every animal. When you get to the peak, he cracks open a fresh coconut he's been carrying in his pack and you drink greedily. You're so glad you came. The new you just climbed a mountain in Mexico. It’s all downhill from here. You wake up and your legs are feeling the hike. No worries - hot shower, coffee, and you're off to class. Afterwards you wander through town and head to the beach. THERE ARE SO MANY SHOPS. Art. Pottery. Jewelry. Tattoo? Maybe. Bikinis. You watch surfers ride waves and take a dip. It feels fantastic. Warm. Salty. You’re looking forward to the evening yoga class. Long slow poses. Meditation. Will someone pass an eye mask? We’re feeling sleepy. You have stamina. Less fear. This is different. At breakfast you decide to take a surf lesson. Your surf guru pushes you on the wave. Bend your knees! Lean into it! You do. You're riding waves. Now it's time to try on your own. Paddling is hard. The timing, falling, laughing. You're surfing. And smiling. After yoga you and your surf crew meet up for dinner. The night is a blur of tan faces, big grins, tacos, tequila and high fives. You like these people. You like Mexico. After yoga the group is headed a few towns to the north for a famous weekly market, then to explore ancient petroglyphs. The market has everything under the sun. Fried, sweet delicious treats and fresh fruits you don’t know the name of. You grab too many tacos and wonder how you'll fit Mexico into your suitcase. It turns out the petroglyphs are spectacular, huge slabs of rock with swirls of carvings. Rocks for altars. Rocks for sacrifice. You get a momentary glimpse of another time. It’s made you emotional. You weren’t expecting that. You're full and satiated. You don’t remember your head hitting the pillow. Your last full day of the retreat. You soak up every moment. More time in the ocean. A long stroll around the neighborhood. Dirt roads. The song of children at play. A life without so many walls. Poolside plans that may or may not ever happen. This doesn’t matter. The connections are real and while you may not see all of these people again, you have one or two new friends. Real ones. This part matters. You wake up wondering how much it'll cost to delay your return home. Yoga settles these feelings, but you know you'll be back. Breakfast is full of goodbyes and see you laters and thank you’s and I’m just so grateful we came. All of us. Together. You gather your things and have a drink by the pool before you go. It’s still vacation, right? Viva La Mexico. The retreat begins with dinner on Saturday, February 2 and closes with yoga and breakfast the following Saturday, February 9. Sayulita is vibrant destination for those who enjoy yoga, surfing, art and delicious cuisine. Its streets are lined with cafes, shops and local artisans hawking their creations. Hotelito Los Sueños sits on the quieter north end of town, 2 blocks from the ocean, cafés, shops and restaurants. 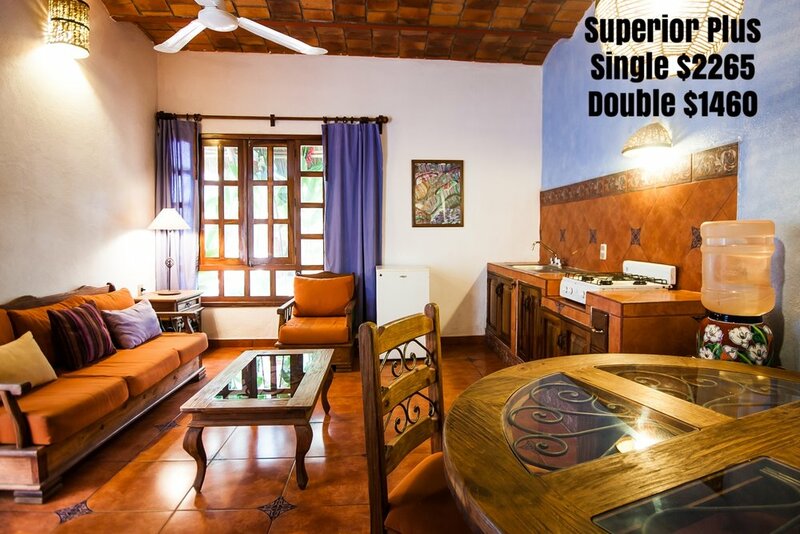 Hotelito consists of two wings, the first is traditional Mexican architecture and the second a more modern style distinct to Sayulita with pools (one saltwater) and gardens in each center. Stay on the grounds and enjoy Hotelito's smoothie bar and sun deck or take a boogie board and bicycle to the beach. Jennifer fell in love with Sayulita in 2002, has been hosting yoga retreats there since 2008, and lived in Sayulita 2013-2015 while teaching at the local studios - including Hotelito Los Sueños. Sayulita offers an extraordinary community of healers, teachers, surfers, artists and guides who Jennifer has been working with for years. Your experience is enhanced through our network of talented friends. Hotelito Los Sueños. is 45 mintues north of the PVR airport. The hotel can arrange for a driver to pick you up at the airport or you can grab a cab for about $60USD. Alternatively, the bus is $2.50USD. The bus stop is reached by crossing the overpass, which is to the left as you exit the airport. The bus is slower than a taxi, with a few extra stops and bumps along the way. There's only one bus stop in Sayulita, which is a 10 minute walk to the hotel. Once everyone is registered, there will be an opportunity to coordinate ride shares for those landing/departing together. We'll occupy half of the hotel and be the only yoga retreat staying on the property. Rooms face the swimming pools and lounge areas and a few have balconies. Check in 3pm/out 12pm. Early check in and late check out are subject to availability. The hotel provides bicycles, boogie boards, beach umbrellas, beach towels, and beach chairs for your use and free calls to the US/Canada from the front desk. All breakfasts + 4 gourmet dinners. Sayulita has an amazing selection of cafes and restaurants. 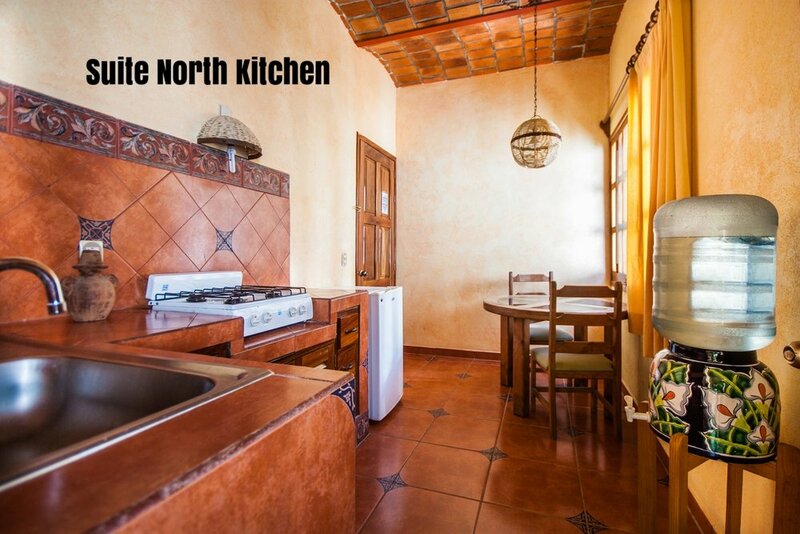 Explore town one meal at a time or secure a room with a kitchen and create your own meals using fresh local ingredients. Airfare is currently $400-$650 to Puerto Vallarta (PVR). Lunch and two dinners. This gives you the opportunity to explore the local cuisine and be on your own schedule during the afternoon break. Hotelito Los Sueños. features A/C, WIFI, luxury linens, en suite bathrooms, refrigerators and lock boxes for your passport and valuables. Each room is unique and will be booked on a first come first served basis. Early registration is highly recommended. Pricing Includes 7-nights accommodations, gratuities + taxes, all breakfasts, 4 gourmet dinners, programming, excursions + activities. * Specific room descriptions, pictures and pricing below. Your $400 deposit is non-refundable. The remainder of your payment will be refunded for cancellations through December 1, 2018. The remainder of your payment will be refunded after December 1, 2018 if a new participant registers. If Jennifer cancels this retreat for any reason, your entire payment will be refunded in full.